You’re likely well-acquainted with Steven Raichlen’s larger than life approach to live-fire cooking. He never misses an opportunity to add flavor using world-influenced sauces, wet and dry rubs, spice pastes, brines, slathers, marinades, glazes, cures, and singular condiments. Never has interest been keener in the components that take grilled and barbecued foods from good to great. Want to know his secrets? 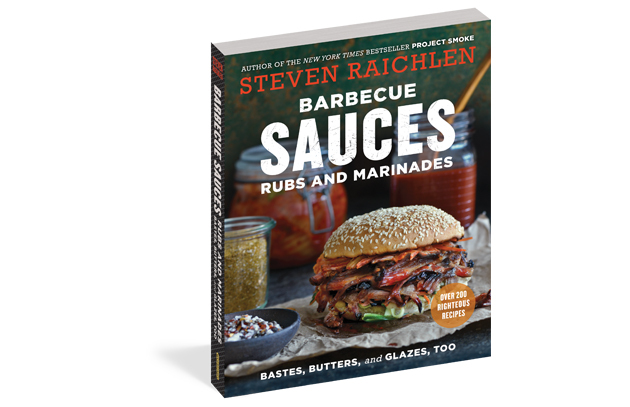 We are thrilled to announce the release today of Steven’s latest book, Barbecue Sauces, Rubs, and Marinades—Bastes, Butters, and Glazes, Too (Workman Publishing, May 2, 2017). With his usual encyclopedic thoroughness, Steven has revised and updated the seminal first edition published in 2000, incorporating the latest flavor trends, more than 50 new recipes (some 200 in all), and global influences culled from Planet Barbecue’s most exciting live-fire cooking cultures. The book, now with color photos, details all of the latest advances in smoking and grilling techniques—including cutting-edge finishing sauces, “after-marinades,” and board sauces that can be created while the meat rests. Acquaint yourself with dishes like Char Siu Chicken Thighs, Barbecue Titans’ Brisket, Righteous Ribs, Persian Saffron Lamb Chops, Cider-Brined Pork Chops, Spice-Grilled Pineapple with Smoky Whipped Cream, the aptly named The Only Marinade You’ll Ever Need, and much more. Along the way, Steven demystifies the use of cures, rubs, brines, sauces, etc. • What’s the difference between a dry rub and a wet rub, or a wet rub and a slather sauce? • When do you use a rub or a marinade? • How long should you brine or marinate your favorite meat or seafood? • When should a sauce be applied? • What tricks do the pros use to create championship barbecue? The goal of Barbecue Sauces, Rubs, and Marinades is to help every home cook become a more skilled and innovative griller. As a result, there’s something for everyone: basic sauces, rubs, and condiments for the beginner; professional preparations for the experienced pit master; classic rubs and sauces for practitioners of traditional American barbecue; and exotic recipes and ideas for adventurers who endeavor to incorporate dishes from their travels into their culinary repertoires. Also included are information-packed sidebars and useful checklists of essential grilling gear and spices. This book is an invaluable resource for any griller or barbecue, a “must have” in your culinary library. Buy yours today! The book makes a great gift, too. For a full listing of events, locations, and descriptions, visit Steven’s Events & Tours.